When trials enthusiasts consider the history of motorcycle trials, they think Sammy Miller, and when they think Sammy Miller they think Ariel. This motorcycle is such an important icon, a true milestone in trials.It separates two eras of trials history, pre-65 and the two-stroke era. The genius of Sammy Miller brought his Ariel to the apogee of technical development and then destroyed four-stroke dominance with an incredible project that created another icon of design, the Bultaco Sherpa. Only two original bikes survive; they had registration numbers GOV 132 and GON 786.Both were extensively used in competition by Sammy, the more famous being GOV 132 which was more frequently used and photographed in observed trials competition while it's twin, GON 786, was often the spare machine and a source of spare parts when need arose but was technically developed to identical level. What became of these two great motorcycles? 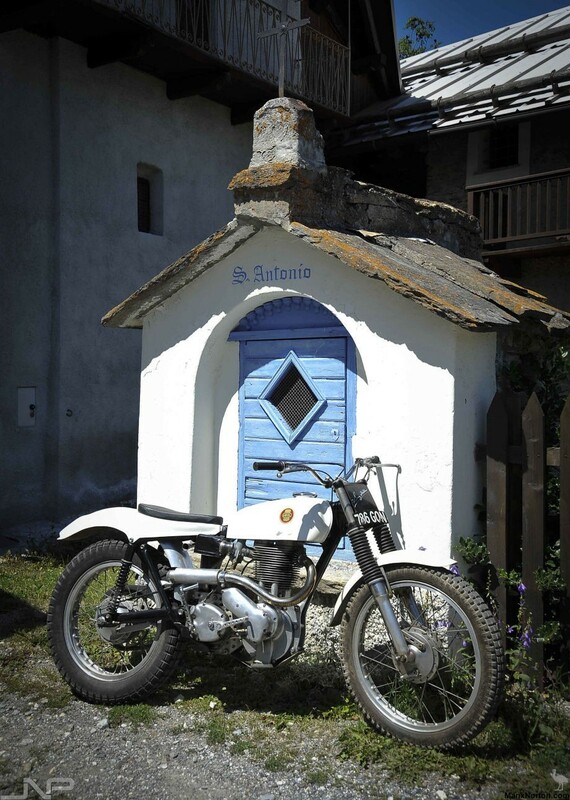 When Sammy took up the challenge of designing a new concept of trials bike for Bultaco he had retained both Ariels when he left the firm in 1965, and the following year sold them to UK Bultaco distributor and trials bikes specialist Comerfords. They put both bikes up for sale, with a price tag £425 for GOV 132 and £350 for GON 786, the latter being less famous despite representing the same level of technical development. In 1970 GOV 132 was bought by famous trials journalist and expert Ralph Venables who asked Sammy to restore it, then gifted it to the National Motor Museum at Beaulieu with one restriction; it must not be ever be sold to leave Great Britain. In about 1983 Sammy began riding in pre 65 trials on a perfect replica of GOV 132 which he built from original spares, and which is on display at the Sammy Miller Museum in New Milton, Hants. When the two Ariel trials bikes were put up for sale by Comerfords one of their employees, Jock Wilson, was already dreaming about buying this bike. GOV 132 was very expensive so his focus was on GON 786, still not cheap at £350 as a brand new Greeves trials was only £207. In February 1965 GON 786 was sold to sidecar trials rider Arthur Fowler who, rather than convert the bike to sidecar use, loaned it to Jock Wilson who used it successfully in trials. At the end of this year Fowler took GON 786 back to Comerfords for sale and this time Jock realised his dream and bought it. Jock has used the bike in many trials including the Scottish in 1967 with a fine result, winning the sub-500 class. Then he sold GON 786 to Harry Rayner who used it for 18 months but with rather less success so he decided to sell it to another rider, John Parry, who after a similar period also passed it on and GON 786 returned to Jock's hands. Understandably, the bike was had accumulated some well-earned character. Jock restored it to perfection and did not use it in competition. Many tried to buy it from him and were turned away, but in 1988 Ernie Page somehow talked him into parting company. Ernie, a genuine trials tragic, bought it to exhibit it as an art piece, and for his similarly afflicted son to rideon rare occasion . This news reached the ear of Italian trials enthusiast Carlo Ramella for whom the sound of a thumper is the baseline to rhapsody. He does not believe it until verification from two reliable sources, at which point he exclaims "I want!" A mutual friend, Pippo Bartorilla, an excellent trials rider, asked if Carlo could show us GON 786 and allow us to make some photographs. Not only did Pippo agree, but he also offered us a ride on this amazing work of art And that, folks, is how we came to visit his chalet in the Alps where we brandished our cameras and were so privileged as to ride this legendary machine. ARIEL GON 786 by Sammy Miller had several innovative design solutions. 1/. Frame: in Reynolds 532 tubing,modified with steeper steering angle,oil in frame. 2/. Fuel tank: Beautifully styled in fiberglass, very light and slim design, one bolt mounting, with depressions at the front to allow full lock steering. Perfectly done by Butler Moulded Laminates, creation of Chris Butler, the builder of "Butler" superlight trials bikes. The metal logo on top of the tank is a real work of art. 3/. Seat base integrated with rear mudguard, another artwork in fiberglass by Butler, very slim in top view in cream white so synonymous with Miller's other Ariel. It also had an integrated registration number plate. Seat perfectly designed light and slim yet comfortable. 4/. Exhaust system: starting with a beautiful curve, extremely compact and well tucked in, terminating with a small silencer breathing hot exhaust gasses directly onto the rear tire tread. This brilliant idea allowed facilitated clearing the rear tire of mud and also heated up tires rubber for a better grip. 5/. Kick starter and gear shift lever bored out to shave some more weight of this bike. 8/. Light fiberglass front mudguard, minimal, nicely shaped yet very efficient and in perfect aesthetic harmony with the rest of the bodywork creating a simply unforgettable bike. All together one must praise the genius of Sammy Miller - this bike is a milestone in design. Should I have written a book about the influence of Bauhaus design philosophy of "Less is More", I would have certainly included photo of this machine. One can only imagine what Sammy Miller would have done if he had worked for Greeves, BSA, or Triumph.